Why Is the Ice Road Speed Limit 15 mph? Islanders find it easy to recognize visitors on the ice road from their big smiles — and often unfortunately — by their excessive speed. Islanders, on the other hand, generally keep to the speed limit because they know the repercussions of driving too fast, and they want the road to be safe and to last as long as possible! There has been a lot of traffic on the ice road over the past two weeks, and yes, there have been speeders who probably didn't understand the damage they might be causing. The cracks above are not dangerous yet, but they do show wear and tear to the road. The dedicated people who manage the Madeline Island Ice Road take great care to keep us all safe. The ice road is a gift, especially to the island's year-round residents, so let's all do our part, be safe, and keep to the speed limit! The basic mechanics of ice roads have been known for decades. 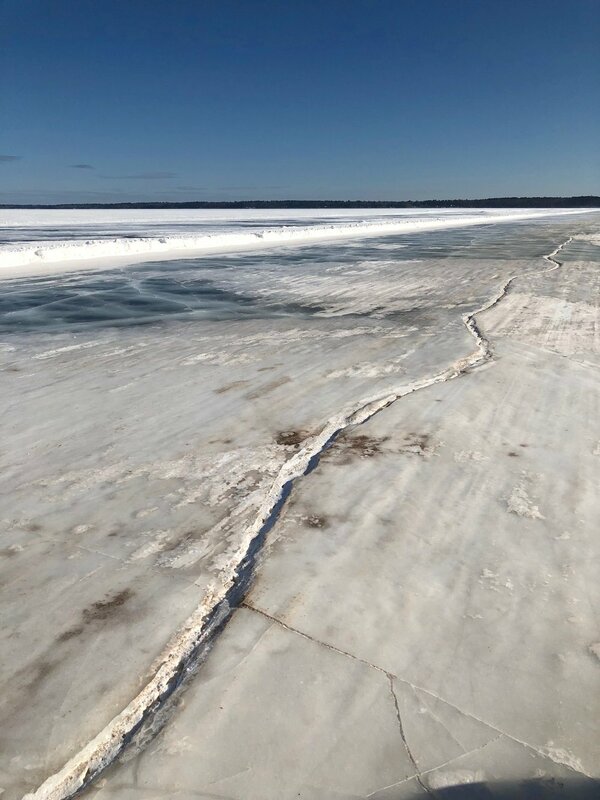 As a laden truck moves over ice, it creates a shallow depression all around it — a sort of bowl in the ice, several inches deep and many yards across. The greater the speed, the deeper the depression. Above a critical velocity that varies with local conditions, a truck can damage the roadbed so severely that the next vehicle to come along will break through the ice. For this reason, the top speed on the Tibbitt to Contwoyto route is usually about 22 mph. In some stretches, as on Waite Lake, the maximum is just a few miles per hour. An earlier section of the road that was closed when it became unsafe.